SAN IGNACIO C.D. 4 - 1 BERRI OTXOA A.D.
OIARTZUN K.E. 2 - 0 TRANSPORTES ALCAINE C.D. ABANTO CLUB 1 - 0 OSASUNA C.A. TRANSPORTES ALCAINE C.D. 1 - 1 SAN IGNACIO C.D. ATHLETIC CLUB 2 - 1 OIARTZUN K.E. OSASUNA C.A. 5 - 0 AURRERA DE VITORIA C.D. AÑORGA K.K.E 1 - 1 VIANES C. AT. 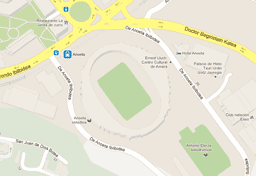 BERRI OTXOA A.D. 1 - 0 TRANSPORTES ALCAINE C.D. OIARTZUN K.E. 3 - 1 OSASUNA C.A. A.D. SAN JUAN 2 - 3 VIANES C. AT. ATHLETIC CLUB 3 - 0 BERRI OTXOA A.D.
OSASUNA C.A. 2 - 1 SAN IGNACIO C.D. GASTEIZ CUP 0 - 1 OIARTZUN K.E. Descansa - AURRERA DE VITORIA C.D. VIANES C. AT. 1 - 1 ARAGONESA U.D. BERRI OTXOA A.D. 2 - 4 OSASUNA C.A. ABANTO CLUB 2 - 0 VIANES C. AT. A.D. SAN JUAN 0 - 0 ARAGONESA U.D. OSASUNA C.A. 1 - 1 TRANSPORTES ALCAINE C.D. GASTEIZ CUP 1 - 2 BERRI OTXOA A.D.
Descansa - SAN IGNACIO C.D. VIANES C. AT. 1 - 0 AURRERA DE VITORIA C.D. ATHLETIC CLUB 0 - 0 OSASUNA C.A. OIARTZUN K.E. 1 - 0 VIANES C. AT. AURRERA DE VITORIA C.D. 6 - 0 ARAGONESA U.D. Descansa - TRANSPORTES ALCAINE C.D. AÑORGA K.K.E 3 - 0 BERRI OTXOA A.D.
VIANES C. AT. 0 - 1 SAN IGNACIO C.D. ARAGONESA U.D. 0 - 3 OIARTZUN K.E. ABANTO CLUB 2 - 1 AURRERA DE VITORIA C.D. BERRI OTXOA A.D. 5 - 1 VIANES C. AT. SAN IGNACIO C.D. 3 - 2 ARAGONESA U.D. A.D. SAN JUAN 0 - 0 AURRERA DE VITORIA C.D. VIANES C. AT. 1 - 0 TRANSPORTES ALCAINE C.D. ARAGONESA U.D. 0 - 3 BERRI OTXOA A.D.
ABANTO CLUB 3 - 1 SAN IGNACIO C.D. AURRERA DE VITORIA C.D. 2 - 0 OIARTZUN K.E. ATHLETIC CLUB 3 - 0 VIANES C. AT. TRANSPORTES ALCAINE C.D. 3 - 0 ARAGONESA U.D. SAN IGNACIO C.D. 3 - 2 AURRERA DE VITORIA C.D. A.D. SAN JUAN 1 - 0 OIARTZUN K.E. VIANES C. AT. 0 - 2 OSASUNA C.A. ABANTO CLUB 3 - 1 TRANSPORTES ALCAINE C.D. AURRERA DE VITORIA C.D. 1 - 0 BERRI OTXOA A.D.
OIARTZUN K.E. 8 - 2 SAN IGNACIO C.D. GASTEIZ CUP 3 - 2 VIANES C. AT. OSASUNA C.A. 5 - 0 ARAGONESA U.D. TRANSPORTES ALCAINE C.D. 1 - 0 AURRERA DE VITORIA C.D. BERRI OTXOA A.D. 1 - 2 OIARTZUN K.E. BERRI OTXOA A.D. 2 - 4 SAN IGNACIO C.D. TRANSPORTES ALCAINE C.D. 0 - 3 OIARTZUN K.E. ATHLETIC CLUB 3 - 1 AURRERA DE VITORIA C.D. GASTEIZ CUP 0 - 2 ARAGONESA U.D. Descansa - VIANES C. AT. A.D. SAN JUAN 0 - 0 BERRI OTXOA A.D.
SAN IGNACIO C.D. 3 - 3 TRANSPORTES ALCAINE C.D. AURRERA DE VITORIA C.D. 1 - 2 OSASUNA C.A. TRANSPORTES ALCAINE C.D. 2 - 2 BERRI OTXOA A.D. ATHLETIC CLUB 2 - 2 SAN IGNACIO C.D. OSASUNA C.A. 1 - 2 OIARTZUN K.E. GASTEIZ CUP 3 - 8 AURRERA DE VITORIA C.D. AÑORGA K.K.E 2 - 2 ARAGONESA U.D. A.D. SAN JUAN 1 - 1 TRANSPORTES ALCAINE C.D. SAN IGNACIO C.D. 3 - 4 OSASUNA C.A. ARAGONESA U.D. 3 - 1 VIANES C. AT. ATHLETIC CLUB 2 - 1 TRANSPORTES ALCAINE C.D. OSASUNA C.A. 4 - 0 BERRI OTXOA A.D.
GASTEIZ CUP 2 - 5 SAN IGNACIO C.D. AÑORGA K.K.E 2 - 2 AURRERA DE VITORIA C.D. TRANSPORTES ALCAINE C.D. 1 - 0 OSASUNA C.A. AURRERA DE VITORIA C.D. 4 - 1 VIANES C. AT. ABANTO CLUB 2 - 1 ARAGONESA U.D. GASTEIZ CUP 0 - 3 TRANSPORTES ALCAINE C.D. Descansa - BERRI OTXOA A.D.
AÑORGA K.K.E 2 - 0 SAN IGNACIO C.D. VIANES C. AT. 1 - 3 OIARTZUN K.E. ARAGONESA U.D. 4 - 3 AURRERA DE VITORIA C.D. A.D. SAN JUAN 1 - 1 OSASUNA C.A. SAN IGNACIO C.D. 1 - 0 VIANES C. AT. OIARTZUN K.E. 0 - 0 ARAGONESA U.D. GASTEIZ CUP 3 - 4 OSASUNA C.A. AÑORGA K.K.E 1 - 1 TRANSPORTES ALCAINE C.D. VIANES C. AT. 0 - 5 BERRI OTXOA A.D.
ARAGONESA U.D. 2 - 1 SAN IGNACIO C.D. ABANTO CLUB 1 - 0 OIARTZUN K.E. TRANSPORTES ALCAINE C.D. 4 - 1 VIANES C. AT. BERRI OTXOA A.D. 2 - 2 ARAGONESA U.D. OIARTZUN K.E. 3 - 0 AURRERA DE VITORIA C.D. AÑORGA K.K.E 1 - 0 OSASUNA C.A. ARAGONESA U.D. 0 - 1 TRANSPORTES ALCAINE C.D. ABANTO CLUB 2 - 0 BERRI OTXOA A.D.
AURRERA DE VITORIA C.D. 4 - 0 SAN IGNACIO C.D. OSASUNA C.A. 3 - 1 VIANES C. AT. ATHLETIC CLUB 7 - 0 ARAGONESA U.D. BERRI OTXOA A.D. 2 - 3 AURRERA DE VITORIA C.D. SAN IGNACIO C.D. 2 - 2 OIARTZUN K.E. ARAGONESA U.D. 1 - 2 OSASUNA C.A. AURRERA DE VITORIA C.D. 1 - 1 TRANSPORTES ALCAINE C.D. OIARTZUN K.E. 1 - 0 BERRI OTXOA A.D.
A.D. SAN JUAN 1 - 0 SAN IGNACIO C.D.